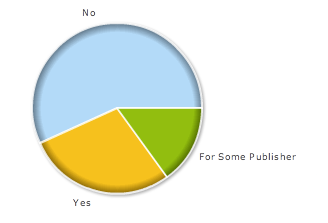 In September, we ran a poll asking Does Google Limit The Amount AdSense Publishers Can Earn? The majority of respondents don't believe so. 57% do not believe in a ceiling, while 28% do and 15% said that the ceiling applies to only select publishers. Personally, I doubt there is any ceiling for 99% of the publishers. I would not be surprised if there were special agreements with some publishers that may limit the amount some can earn - but that is just a wild guess. This post was pre-written and scheduled for publication on October 14th.